We balance every element to create sliding wardrobes and fitted furniture that is not just ingenious in its practicality but visually striking too. Whether you’re looking for a storage solution for a tight corner or a beautifully organised walk-in wardrobe, Infiniti2 can make it happen. Pop into our showroom to discuss your needs - we'll then come and measure your space and once you're happy with the designs, we aim to install within 6-8 weeks using our own installation team. Planning a Project for Spring 2019? Welcome to Jim Sharples Furniture designed and handmade with skill and passion We’ve been designing and handcrafting bespoke fitted and freestanding furniture for more than 15 years. Whatever you’re looking for, we can make it to exacting standards using the best materials for the job. Why not tell us all about your dream project and see how we can help? With over 20 Years’ experience between us in all areas of carpentry and joinery, we are able to provide detailed and confident advice, design and planning for all your bespoke joinery needs. 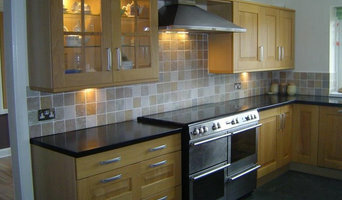 We can design, manufacture and install handmade bespoke kitchens and fitted furniture. If you are looking to create a one-off design or seeking real value for money, we have the experience and expertise to accommodate your needs. All of our kitchens, bedrooms and furniture are made from quality, sustainable materials. As a result, our furniture is of superior quality and is built to last a lifetime. Jonathan Lear Furniture, based just outside Bristol, design and make all types of bespoke furniture - fitted and free standing, including kitchens, home offices, bedroom and living room furniture. Using sustainable materials bought locally, we are able to advise and offer creative design solutions that will maximise your space and enhance your home. Quality is of the utmost importance, from the materials we source to the finishes and fittings we select. Excellent design sense is also essential to ensure that the design details are perfect in both aesthetics and function. This comes from experience and a thorough understanding of furniture design. Our services include a no obligation free consultation in your home where we will guide you through design alternatives, different material choices and finishes all tailored to suit your budget. Burke and Marshall is a handmade furniture partnership between brothers Sam Burke Phillips and James Marshall Phillips. In a modern day world of fast, factory made disposable furniture we quietly and diligently craft furniture to last. From our workshop in Bedminster we design and make each piece by hand, either as a bespoke solution to our client's brief or to order as a limited edition from our growing collection of designs. We also sell a range of smaller items handcrafted in beautiful timbers for the home in our Casa Curio collection. Newleaf Furniture are cabinet makers specialising in bespoke furniture and storage solutions, and are a member of the Guild of Master Craftsmen. We can create, with you, a unique design that will enhance the look of your home and become one of the family for generations to come. 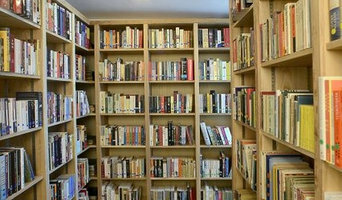 Do you need affordable, bespoke, storage solutions? If so, Newleaf Furniture design can now offer you a solution that helps you make better utilisation of the space in your home. We provide a full service, from design and manufacture to installation, ensuring that you get a quality product and the service you require. Using beautiful materials, King and Webbon are designers and makers of freestanding and fitted furniture ranging from stools to kitchens. We believe in quality craftsmanship and timeless design. We have an increasing range of furniture in our collection, and also specialise in bespoke design and commissions to your exact requiements. Since starting Perfect Space Carpentry in 2010, my aim has been to make smart great quality furniture. Coming from a creative background, I'm really interested in clever design and spend time planning every detail. Each project is tailored to the requirements of the client, because there are so many possibilities and ideas each commission is completely unique. Working from my workshop, my team and I make all kinds of bespoke furniture and joinery; including wardrobes, kitchens, storage solutions and one off furniture items. We develop your own style and ideas to create something you will be proud of and that will last for years. Because we care about our environment the workshop runs on energy from a green supplier. We only use FSC PEFC approved timber and our workshop is powered by green energy. All scrap timber is recycled and we only use recycled packaging. Our Process: 1. Site Visit The first stage is to come and have a chat. We love talking about furniture, so are always happy to discuss your ideas. Together we can form a rough idea of styles, materials and finishes that will work for you. We do not charge for this visit. From here we can work out some initial costs. 2. The Design Stage With all the ideas gathered the design stage is where we refine and perfect the details, we produce detailed scale drawings for your approval, we can also offer you full 3D CAD models to help you get an idea of the bigger picture. 3. The Build All our work is prepared, built and finished in our workshop ready for an efficient no fuss fitting on site. This extra preparation in our workshop means minimal disruption to your home. All our tools have dust extraction fitted so when making small adjustments there is nothing to clean up. Nick Crossling is a Bristol based furniture maker creating built-in fitted furniture as well as freestanding pieces. He has been running a successful small business, working with clients in Bristol, Bath and London since 2004. Central to Nick's approach is to fully understand your requirements in terms of both function and form, so he can best achieve what you envisage, whether a you already have a clear idea or whether you need some inspiration on how to best use the space in your home. Nick's priority is to discuss and listen so that your ideas can be translated and fine tuned into a workable design that meets your exact requirements whether it be a traditional built-in alcove cupboard or a contemporary bespoke wardrobe in an awkward corner. All Nick's work is finished to the highest quality and without exception he pays close attention to detail. He aims to complete most of the making of the furniture in his workshop and with fitted furniture just the final stages of completion in your home, always taking great care to be clean and tidy. Radiance Furniture creates award winning contemporary bespoke furniture, interiors and joinery made in our workshop between Bath and Bristol. We provide a complete service; design and make, just design or we can create your designs to the highest quality. We work with private customers, architects, interior designers and developers around the country. Our work reconciles contemporary design with a timeless aesthetic by combining functionality, innovation and artful craftsmanship. It’s important to us that each piece is designed and made to the highest standards, and will continue to be functional and beautiful for many decades to come. Get in touch today! Let's get started on your project. Designers and Makers of Bespoke Handcrafted Interiors, Furniture and Built in Joinery. Workshop was set up in 2013 & is run by David & Charlotte Pidgeon. Based in a beautiful barn near Norton St Philip the design studio & joinery workshop run side by side to create unique, well designed interiors and furniture with a high quality finish. Charlotte has over 8 years design experience & her strengths include building strong client relationships. From the early concept to the completion of the project she likes to work as closely as possible with the client to create a design which exceeds their expectations. Previous to forming Workshop Interiors David ran his own joinery business, making & designing bespoke pieces for numerous high-end residential & commercial clients. David always goes the extra mile, his love of materials & technical knowledge mean that he can offer unique & creative solutions, achieving excellent results for his clients. We love a challenge, no matter how big or how small, we are always happy to discuss your project with you. Buscott Woodworking is a partnership with over 55 years experience in the manufacture and fitting of bespoke architectural joinery and cabinet making. We offer a very diverse skill set ranging from a finest quality dining table to a large timber building. Our projects are taken through all the stages of manufacture from the initial design to installation ensuring that a high standard and good client working relationship is maintained. 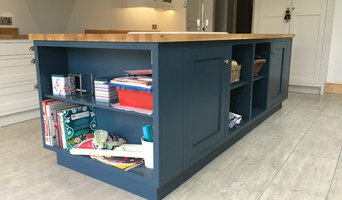 Paul Bishop Bespoke Kitchens is a small cabinet making and joinery company based on the outskirts of Bath specialising in high quality bespoke kitchens, furniture and joinery. Paul has been in the industry for 27 years completing his City and Guilds in carpentry and joinery in 1987, and gaining the advanced craft certificate and skill build certificate in 1988, 2 Nebosh level 3 health and safety certificates were gained in 2010. Much experience was gained working for local companies including F.W Hawker, Colin Pearce architectural joinery, and 14 years at McFadden cabinetmakers where design, build and installation knowledge were gained. The P.B.B.K team are able to offer design, build and installation services but are also experienced in working to architect plans and designs or bringing client ideas to fruition. 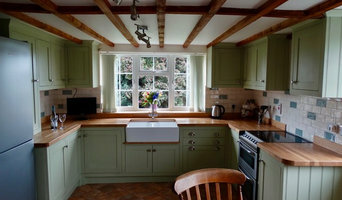 P.B.B.K can manufacture traditional or contemporary bespoke kitchens, furniture and joinery. Previous and existing clients include, James Dyson, Norris McWhirter, Peter Gabriel, Jane Seymour, Toyota, Creon Hotel Paris, Titcombe jewellery, The Tate Modern Museum, John Terry, Ebley Mill Stroud, Minibar UK, Mori Architects, Coppice Guild. Furniture by Design – Chris Thompson is a Stroud based traditional craftsman who creates bespoke furniture to individual commission. The highest quality of bespoke workmanship coupled with an eye for design and an appreciation for the natural beauty of wood, produces each stunning and unique piece of furniture. You the customer, are involved at all stages of the bespoke design and build – from the selection of the wood to the finished piece. Furniture By Design has worked on many internal and external bespoke commissions, from cloakrooms to bookshelves, media units, office furniture ,interior and exterior doors. Bedrooms and Kitchens benefit from the warm natural feel of wood from custom bespoke designs to drawer and door replacements. Furniture by Design has created a variety of doors styles that personalise the home and office as shown. He uses a full range of natural woods sourced locally where possible. Functional manmade materials such as MDF can be painted to your specification to suit your surroundings. Furniture By Design aims to make bespoke furniture which is unique to you and your home, maximising your environment by accessing those awkward areas. Why should I hire a Bristol cabinet maker? Cabinet makers are skilled craftsmen who can design, make, rework and repair cabinets and cupboards. They can create bespoke storage or kitchen units for your home that meet your needs and fit with your interiors. They can also advise you on materials and cabinetry styles if you’re not completely sure on the design yet. 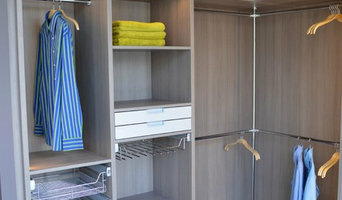 With the right bespoke cabinet makers in Bristol, no cabinetry job is too difficult, so even if you have a tricky corner space that you want to utilise, a Bristol cabinet maker can create a cupboard to your specifications. Bespoke cabinet makers are more than just bathroom or kitchen cabinet manufacturers and they can be commissioned to create storage cabinetry around the home. Bespoke TV cabinets are in popular demand due to the variations of TVs, consoles, digital TV boxes, DVD players and other items that we want to keep near to our televisions. Skilled cabinet makers in Bristol can create a one-of-a-kind TV cabinet or media centre to house all your entertainment goodies. If you already have cabinets or cupboards that you’d like to keep, but they’re just in dire need of a facelift, then bespoke cabinet makers may be able to help, too. You may wish to replace kitchen cabinet doors, give your cupboards a new colour, add decorative elements or use a special finish; whatever the cabinetry task, ask cabinet makers in Bristol if they can help you. If you need the help of a cabinetry professional when renovating a home, make sure they are happy to work with any other professionals working on the project. Here are some related professionals and vendors to complement the work of cabinet makers: Kitchen & Bathroom Designers, Kitchen & Bathroom Fitters, Interior Designers, Home Storage Designers & Professional Organisers, Carpenters & Joiners. How long have you been cabinet makers in Bristol? Find a cabinet maker on Houzz. Narrow your search in the Professionals section of the website to Bristol bespoke cabinet makers and cabinetry. You may also look through Bristol photos to find examples of cabinets that you like, then contact the cabinet makers in Bristol who worked on them.